Aldous Leonard Huxley was a British author, most famous for his novel Brave New World. One of the psychedelic pioneers who brought to the modern world an eclectic view of the raving psychedelic culture that stemmed from the use of psychedelics such as Mescaline and LSD to attain altered states of consciousness, to tune into other higher realms and parallel universes ! Aldous Huxley wrote 'The Doors Of Perception' inspired by these words of William Blake ... "If the doors of perception were cleansed every thing would appear to man as it is, infinite. For man has closed himself up, till he sees all things through narrow chinks of his cavern." 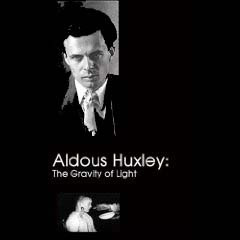 Aldous Huxley's The Gravity of Light is a feature film essay on Aldous Huxley's cultural criticism and social prophecy in light of the new millennium, the dawning of the age of Aquarius. A contemporary reading of Huxley's oeuvre, a rendition and interpretation, inspired by an immersion into his life and thought. Complex, iconoclastic, psychedelic, and historical. Aldous Huxley: The Gravity Of Light incorporates rare archival footage, computer rendered 3D animation, speculative fictions, and selections from his essays. Personal in tone, the film also recalls the impact of Huxley's LSD-25 and mescaline experimentations and writings for a whole generation of youth and examines the utopianistic impulses associated with the recent Rave scene. The work reflects the aesthetics and poesis of the psychedelic state without collapsing into the tie-dye cliches that have trivialized the '60's era. Doctor Jean Houston, a senior advisor to the United Nations on matters of Human Development, eloquently speaks on the immense contribution Huxley has made concerning the possible human. Special thanks to Laura Huxley and Jean Houston. "Hockenhull's simultaneously thoughtful and carefully conceived approach to the subject has made for a kind of documentary I would not hesitate to compare with the works of Trinh T. Minh-ha in form and self-reflexivity and Derek Jarman in style and composition. Hockenhull's approach to this "hybrid" form of cinema manages to aggressively question our presumptions and preconceptions around the current Zeitgeist while simultaneously exploring the knowledge and impact of one of the twentieth century's greatest minds." so many of the docus in this site are not working, both at google videos and youtube. it really is a pitty. i otherways used to enjoy this blog.